Moto Laverda Company was created in 1949 by Francesco Laverda. The roots of the Laverda Motorcycle company go back to 1873, when Pietro Laverda (1845-1930) decided to start an agricultural engines enterprise in the small rural village of Breganze. Almost exactly three quarters of a century later, with a spirit of enterprise and feeling the need to improve the situation of an economically underdeveloped region which had suffered badly from two world wars, in October 1949, Pietro's grandson Francesco founded, Moto Laverda S.A.S - Dottore Francesco Laverda e fratelli. Laverda is an Italian manufacturer of Combine harvesters and one-time a manufacturer of high performance motorcycles. The motorcycles in their day gained a reputation for being robust and innovative. In October 1949, Francesco Laverda founded, Moto Laverda. Laverda became well known for building small capacity machines of high quality, durability and relative innovation for the time. To prove this, right from the beginning they modified their bikes in order to race them in distance and endurance events like the Milan-Taranto, the Giro d'Italia and the Cavalcata delle Dolomiti. In 1951 upon their first entry in the Milan-Taranto, the 75cc Laverda's finished 4th, 5th, 6th and 10th in their class, racing against renowned marques like Ducati, Moto Guzzi, Alpino, Verga, Cimatti, Navarra, Arditto, Capriolo and Ceccato. Inspired by these results, and after once again improving their bikes, Laverda entered 20 bikes the following year in the 15th running of the Milan-Taranto in 1952. In this race which covered a distance of 1410km they took the first five places. The winner was Nino Castellani, L. Marchi came second and F. Diolio came third. In total they had 16 bikes amongst the first 20 of the classification. Laverda motorcycles thus became a firm favorite among racing clubmen due to their record for reliable performance. By the late 1960s, Francesco and brothers began sketching out a new breed of large motorcycles that would be built around an all new 650cc parallel twin engine. The brand was now sufficiently strong and well known, and Francesco's son Massimo had just returned from the USA where it was clear that sales were dominated by large capacity British and American hardware. Above all this, was a desire to produce a prestigious and powerful machine that could conceivably take on the best and finest from Moto Guzzi, BMW and the rapidly emerging Japanese. In November 1966 Laverda debuted the result of this thinking with the 650 prototype at Earls Court in London. 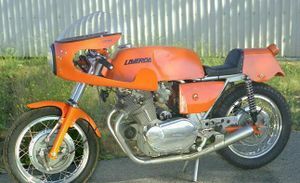 While not an extreme sport bike in any sense, it exhibited all the virtues that Laverda had become synonymous with, while at the same time it revolutionised the concept of a big bore bike so far being synonymous with British. 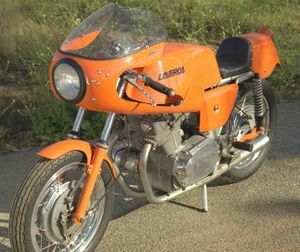 After this first appearance however, Luciano Zen and Massimo Laverda retreated until April 1968 working hard in order to perfect the bike enough to enter four motorcycles in the prestigious Giro d'Italia, with three of the four entered bikes already having an increased capacity of 750cc. The 650cc Laverda gained victory in her class, the three 750 cc bikes ending amongst the first 10 of their class! Two weeks after this victory the first 650 cc production models left the factory! The bikes carried the finest components available at the time, from British Smiths instruments, Pankl con-rods, Ceriani suspension, Mondial pistons, to Bosch and (revolutionary at the time!) 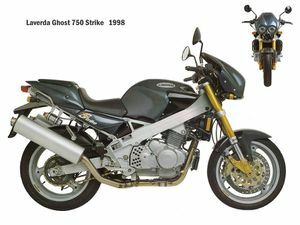 Japanese Nippon-Denso electrical parts, thus eliminating the one problem plaguing nearly all contemporary British and Italian motorcycles at the time: their electrical unreliability. The 650cc offered superior comfort and stability with its handling at least equivalent to the competition. Of course, it also carried a high price. A total of 52 Laverda 650cc's were produced. 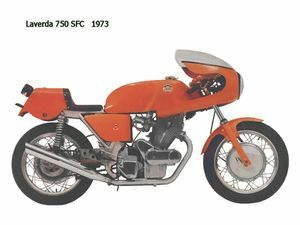 The true birth of Laverda as a serious competition brand however happened with the introduction of 750cc which basically was issued at the same time as the 650. The first bikes however were produced for the American market under the brand "American Eagle", which were imported to the US from 1968 by Jack McCormack. The bikes were basically identical to the 650 except for the cylinder dimensions and an upgrade from 28mm to 30mm carburetors. In 1969 the "750 S" and the "750 GT" were born, both equipped with an engine which would truly start the Laverda fame. Raced by the factory right from the prototype stage, the machines proved their reliability by finishing every race they entered, eventually taking some victories. Just like the agricultural machinery made by the other family business, Laverdas were built to be basically indestructible. 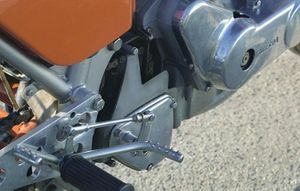 The parallel twin cylinder engine featured no less than five main bearings (four crankcase bearings and a needle-roller outrigger bearing in the primary chain case cover), a duplex cam chain, and a starter engine easily twice as powerful as needed. Of course, this made the engines and subsequently the entire bike heavy, heavier than, say, a Ducati 750 of the same vintage, but they were prodigiously fast and stable. 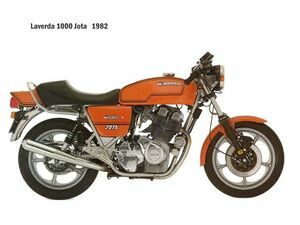 Laverda made motorbikes from 75 to 200ccs between 1949 to 1969. 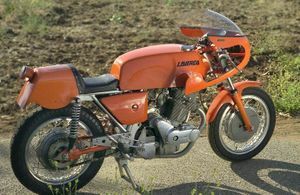 Later, it produced the 750 LAVERDA which sold well across Europe and the U.S. 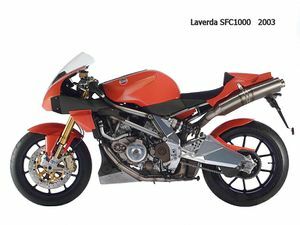 The Laverda brand was absorbed by Piaggio, when in 2004, Piaggio absorbed Aprilia. This page was last edited on 21 January 2011, at 02:40.